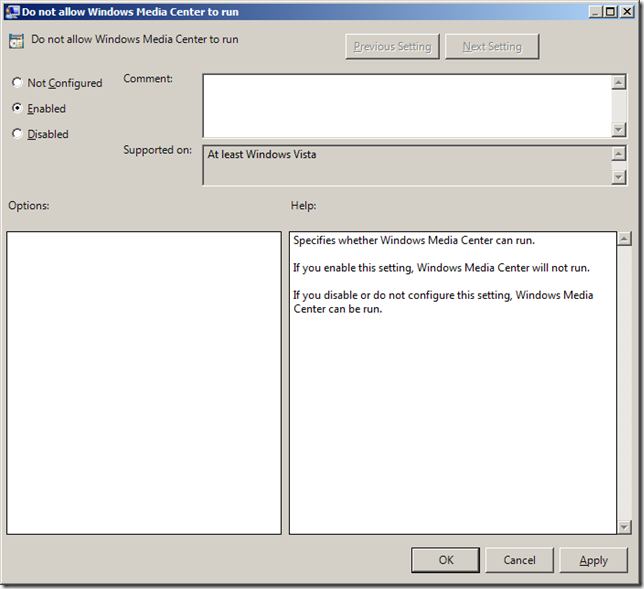 The setting of the week this week prevents users from running Windows Media Center on Vista or above versions. Unlike Windows XP which had its own dedicated version of Media Center, Vista Enterprise and Ultimate editions and Windows 7 Business, Enterprise and Ultimate had inbuilt support Windows Media Center. This setting would most likely be used in a corporate environment where they wanted to control the running of unproductive applications. This is either a user or computer based setting that can be found under Computer Configuration > Policies > Administrative Templates > Windows Components > Windows Media Center meaning you can either selectively apply it to users or to all the computers in your fleet. When the setting is enabled the user will still see the shortcut to Windows Media Center however when the user tries to run the program they will be presented with the following dialogue box.